Earlier this week the federal Energy Minister Angus Taylor took to Radio National to kick off another round of scare campaigning against renewable energy and climate action, using dodgy modelling to attack the Labor opposition’s policies. Enough is enough. Instead of trying to scare voters, the Coalition should be scared of the public for the party’s failure to act on climate and ramp up investment in wind and solar. Why are they still delaying the landmark Star of the South offshore wind farm? We have confirmation that Angus Taylor has been briefed by his Department and media have hinted the Morrison government are close to making a decision about the initial exploration license. But Taylor is running out of time to act. If it goes ahead it would create thousands of jobs and power as many as 1.2 million homes with clean energy. It’s time to ramp up. 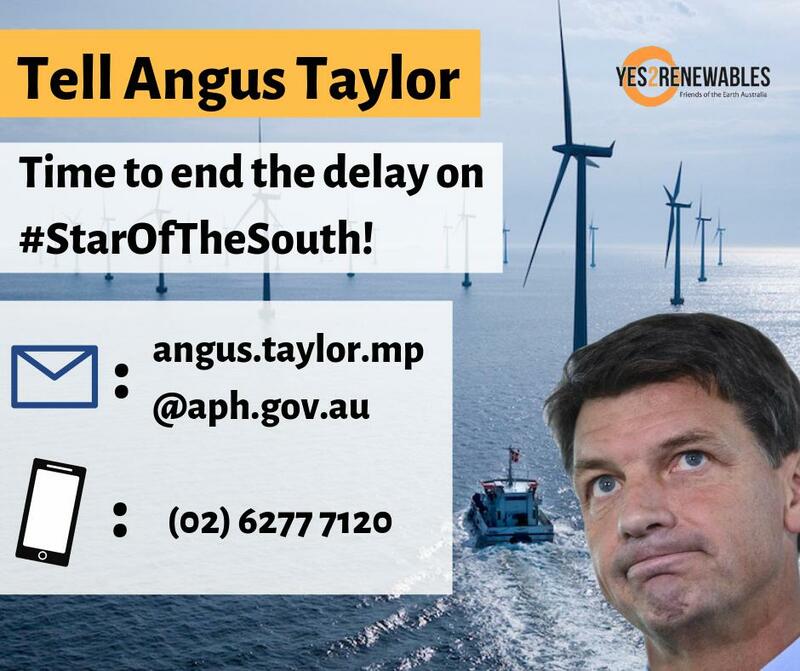 Today we’re asking everyone to call and email Angus Taylor with these three simple messages: It’s disappointing to see the Energy Minister spreading misinformation about renewable energy and action on climate change. All parties should be able to build renewable energy to create jobs, deliver cheaper power and cut emissions. If the Morrison government are serious about acting on climate while delivering cheaper power why has the Minister been delaying the landmark Star of the South offshore wind farm? Here are some key facts about Star of the South to help you out: Star of the South could power up to 1.2 million homes, or as much as 20% of the state of Victoria. The offshore wind farm is expected to avoid as many as 10.5 million tonnes of greenhouse gas emissions every year. It’s predicted 2,000 direct jobs would be created during construction, as well opportunities in manufacturing & ongoing maintenance work. Please let us know if you call or email so we can keep track of the action. Let’s do this! Contact Pat 0415 789 961 | (03) 9419 8700 See previous Star of the South posts here and here.